Manager Alan Stubbs is sure Hibernian can arrest a dreadful slump and end the season on a high. Saturday's 1-0 loss at relegated Alloa means the Easter Road side have collected a mere four points from their last seven Championship games. Falkirk, six points ahead in second place, visit on Tuesday. "You look for responses and there's a lot of big characters in the dressing room and at times like this we need them to shine through," said Stubbs. Stubbs said he was "surprised" by a "disappointing performance" at part-time Alloa, adding: "We need to move on very quickly. "I'm glad we've got a big game that can pick us up." The former Everton defender also insisted he would have no difficulty lifting his players for the match against Falkirk, who have played two more games in the league. "The players have pride and that pride has been dented," Stubbs told BBC Scotland. "But they know it's just a matter of time before it changes again. "There's a lot of quality in the dressing room and that's what give me the confidence to know that as well losing a few games you can very easily win a few." 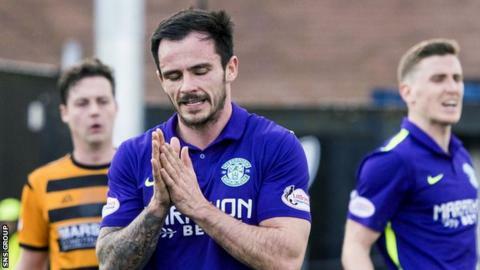 Hibs finished a distant second behind Hearts last year only to fall against this season's champions Rangers at the semi-final stage of the play-offs. Failing to overhaul Falkirk would mean two legs against Raith Rovers, with the Bairns waiting in the semi-final to decide who meets the 11th-placed side from the Premiership. "Obviously, we would like to finish second," said Stubbs. "How important that is, I don't think anyone can tell. "We had it last year and it didn't necessarily point to us having a better opportunity to get promoted. "Some will say not having that break can work in your favour and it's another chance to build momentum." Hibs lost the League Cup final to Ross County last month and will be back at Hampden on Saturday for a Scottish Cup semi-final with Dundee United. "Our priority is promotion," said Stubbs. "It has been from the beginning. "But we have an opportunity to get to another major final. Our attention is on Falkirk first, then we look forward. "I can't emphasise this strongly enough; we have, potentially, a very exciting end to the season. "While that's in front of us, we're going to be doing our upmost to make that possible."